Subtle. Distributed. Small. Catalytic. Empowering. Made with minimal and local means, applied and tested since 9000 BCE. At this year’s World Water Forum multiple organizations questioned the efficacy and social justice of large dams (‘large’ defined as those taller than 15 meters or with a reservoir volume of at least three million cubic meters), and speculated on the potential of other means for providing energy and/or water supply. One of those technologies is the sand dam. 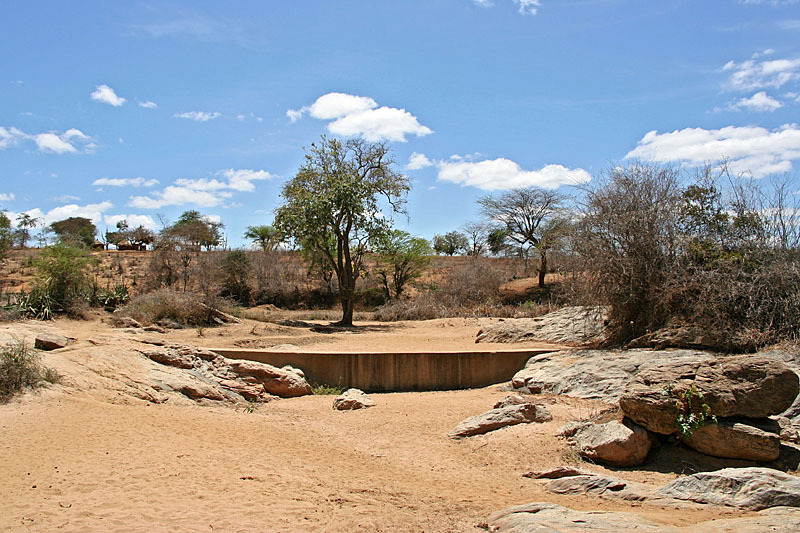 Sand dams are small concrete or stone structures placed across an ephemeral stream to store water in dry climates. The skill in designing these structures comes in siting them in such a way that their reservoir will passively fill with sand over a bottom of bedrock. What then seems like a clogged piece of infrastructure is a sophisticated sub-surface reservoir. 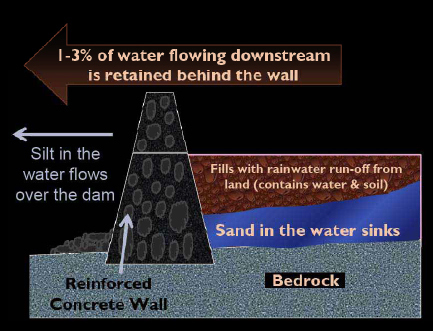 During a rain event, a portion of flashy, turbulent stormwater traveling overland percolates into the accumulated mass of sand, the porosity of which allows for that water to occupy 40% of its total volume. As it passes through, water is filtered by microorganisms recruited within it. Once stored, it can supply year-round water for around 1,000 people. The water supply is largely safe from biological contamination, and unlike open reservoirs, it’s not subject to high rates of evaporation loss. Sand dams are relatively simple to construct and can be built by a constituent community for their own empowerment and self-sufficiency. The materials required are mostly local and reconfigured from the stream itself. Should the infrastructure fail, it can be repaired or remade. 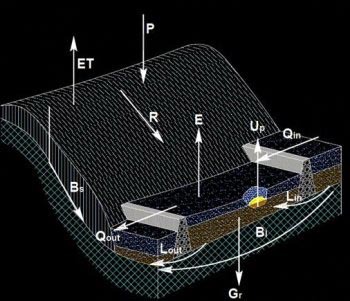 Through deceleration, sand dams amplify riparian processes. 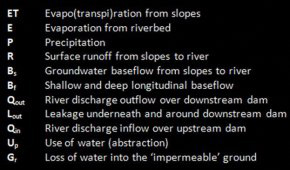 By capturing runoff, they elevate the surrounding water table, drawing more water towards themselves (see above graphic), which in turn increases vegetative cover and tree canopy. A tactical wall inserted into a dry stream bed engenders a cascade of effects. 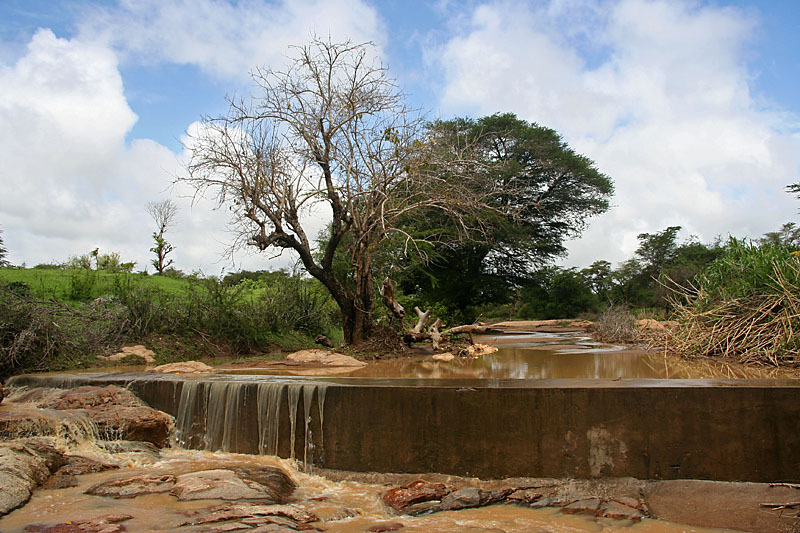 Sand dams are like the rural and upland equivalent of the Venetians’ network of sand cisterns. The technique was perfected as far back as 9000 BCE. The Roman’s made sand dams and they were also once used in the Southwestern U.S.
We’re quite interested in the latent potential of simple, effective and largely forgotten technologies such as these; techniques that have fallen out of our infrastructural vernacular, yet seem ripe for re-articulation in the present. What if, for example, thirsty cities like Las Vegas just didn’t have the option of building more pipelines to borrow ever-more water from ever-more distant landscapes? What if the base of the foothills surrounding that city were chock full of a distributed network of hybridic and almost unnoticed aquifers? As that city’s suburbs creep into the steeper terrains at the edges of its valley and the price of water increases, is it so far-fetched to imagine developers coming around to building subdivisions with such reservoirs? Or is it more likely that residents living at those far edges might eventually take the initiative to build them themselves? I would say “Or is it more likely that residents living at those far edges might eventually take the initiative to build them themselves?” if only from the perspective of a growing (although maybe not in Nevada) interest in personal resilience, permaculture etc. Although “developers coming around to building subdivisions with such reservoirs?” would certainly fit in more with the “free market” ideology espoused by certain portions of our political spectrum.